Detail from The Giant Squid (cut paper and LED light).Marcela Staudenmaier's solo show of cut paper illustrations runs at the Mitchell Branch of the New Haven Free Public Library through April 25. Lucy Gellman Photos. A little girl presses her nose to the aquarium glass, her body just a fraction of the wide oval window that surrounds her. Her hands reach up and out, fingers spreading as if to say a warm, wordless hello. She has company—a giant pink squid who glides through the water before her, tentacles rippling like ribbon. It fixes one pupil on her, the surrounding white of its eye almost as big as her head. Another appears behind it, making its way through the dark water. 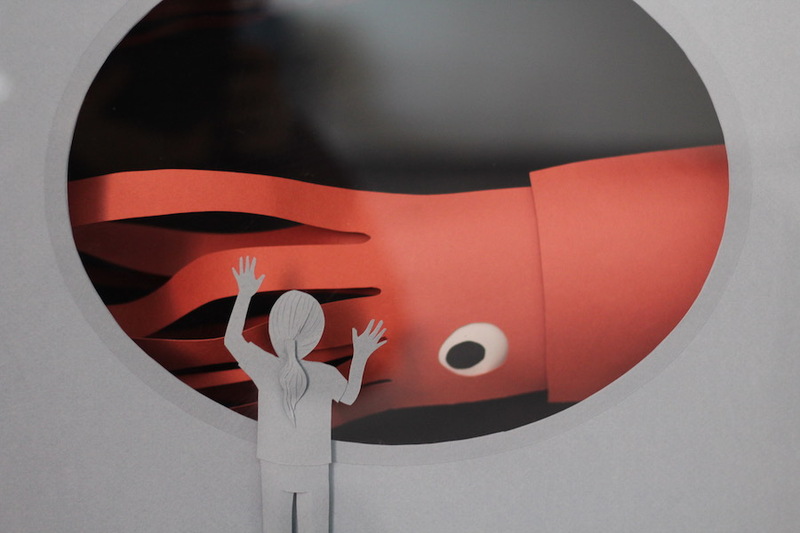 Marcela Staudenmaier’s Giant Squid is one of a handful of works in Cut Paper Illustrations, a solo show on view at the Mitchell Branch of the New Haven Free Public Library (NHFPL) now through April 25. 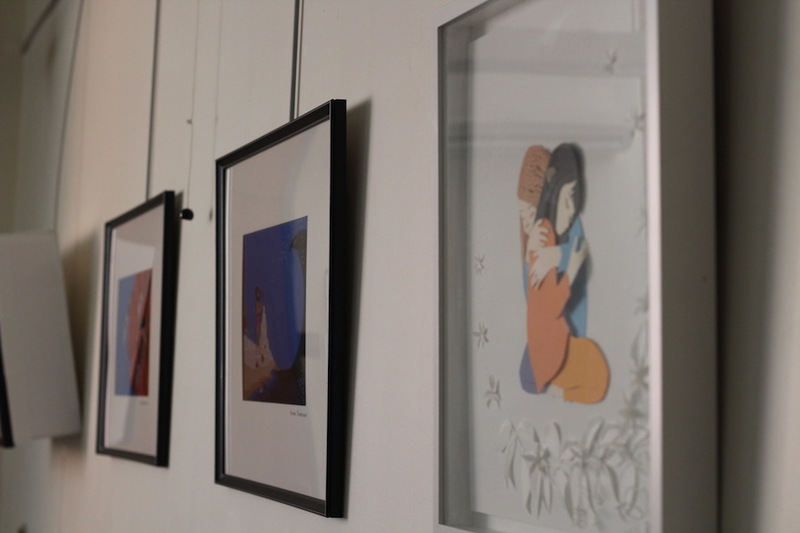 Showcasing a series of cut-paper compositions by the artist and illustrator, the exhibition brings a literary dreamscape to the library, where it feels that it has belonged forever. 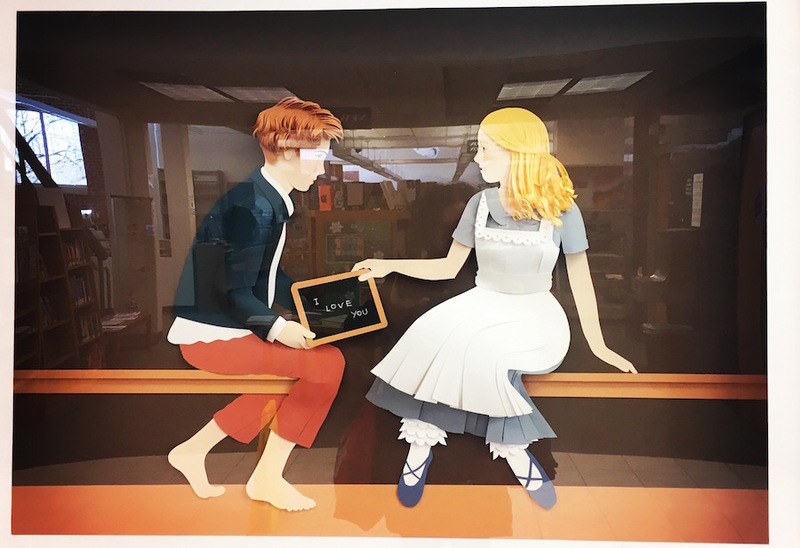 Staudenmeier, who uses the pieces to fuse her training in illustration and architecture, has written that “through my work I intend to to evoke a sense of wonder and playfulness.” And she does, starting with a large piece titled Tom and Becky that sits in the hallway between the library’s front door and community room. It pulls the viewer in with its tactility—the scallops of Tom’s white shirt and soft fold of his red pants; the starched pleats of Becky’s jumper and near-rustle of her hair as she whips her head to face tom. Against a brown backdrop, the two share a bench, faces turned to look straight on at each other. They are young and fairy tale sweet—just kids in some one-room schoolhouse that doesn’t exist anymore, but made it into the history books before it fell apart. On the right side of the piece, Tom leans in red-cheeked, his hair a blonde mop atop his head. His blue blazer catches in a light from the frame, almost gleaming. His feet, posed just so beneath his too-short red pants, are bare. Becky sits just inches away, feet raised from their place in second position. She takes a miniature chalkboard from his lap. “I love you,” it reads across three registers. Their knees never touch. It's that kind of adorable. We don’t know who Tom and Becky are—too gentle to be of this universe, almost certainly—but it seems that we don’t have to. We’ve seen them before in our anthologies of the Brothers Grimm (at least, in the Americanized versions where everything turns out okay), in Robert Southey’s Goldilocks, in museum recreations that fill us with nostalgia and the Disney jokes that are worked into movies for adults. There’s sweetness here, in a world that doesn’t always account for it. As the exhibition’s 12 other works beckon from the library’s community room, Staudenmeier keeps that sense of magic and momentum going. Form fits function—her pieces are reminiscent of pop-up books, viewers transported to fantastical realms they may not have visited since childhood. In one, two young girls ride along on the ridged, mammoth blue backs of baleen whales, the animal's mouths sprinkled with grey. The whales, raised in cut paper, glide through an expanse of blue water. Nothing, it seems, can puncture this moment—not the imperiled state of our oceans, not the near-extinction of some baleen whales, not the fact that these young protagonists are clearly in their pajamas, sans scuba masks. The girls, backs gently arched like the mammals that carry them, fly through this aquamarine fantasy. 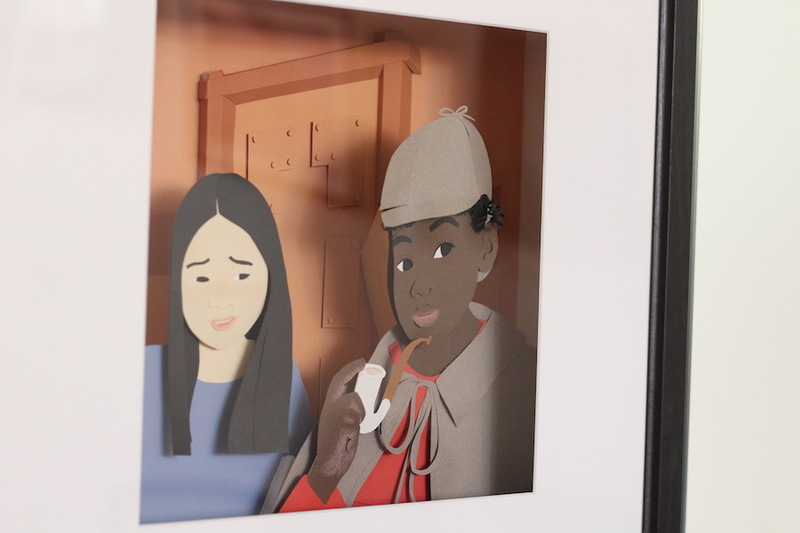 In another, titled Young Sherlock, Watson and Holmes have been transformed into two young women of color, Holmes half-smiling out of the frame as Watson looks on with a skeptical kind of delight. Or another, where the artist has constructed six perfect paper cut out cakes, seeming to laugh at her own joke as she titles them 100 Percent Paper Cakes. That’s the thing about these pieces: Staudenmeier gives viewers permission to feel safe for a moment, long enough to remember what it feels like to experience wonderment. Or maybe, it's just the permission to feel wonderment. We all secretly (or not-so-secretly) want to be that girl in When You Sleep, her button of a nose puffing and contracting with gentle breath while a kitten sleeps in the same position nearby. Or the two girls in The Embrace, where a long hug between friends looks like it could cure all ills. Or the little girl in Wave, who plants a red flag on the top of a sandcastle as the big backwards C of a wave rises toward the shore. Something is gentle about this water, as if it’s more likely to tap her on the shoulder than to wash it all away. And yet, looking at the pieces in the show, we feel like we’ll be okay if the latter happens. In our world, we’ll take a deep breath and remember to open our eyes to the wonder around us. In hers, she’ll just start all over again. The Mitchell Branch of the New Haven Free Public Library is open Monday 12-8 p.m., Tuesday 12-6 p.m., Wednesday and Thursday 10 a.m.-6 p.m., and Saturday 12-5 p.m. at 37 Harrison St. in New Haven's Westville neighborhood. For more information, visit the New Haven Free Public Library online.